Good for the heart, great for weight loss and a boon for healthy eyes, teeth and bones, zucchini is first up on our list. It’s a great source of vitamins C and A, which help to boost the immune system and guard vision. Zucchini is very easy to grow and, when picked regularly, will give plenty of versatile fruits throughout summer. Cut them young, just 4in (10cm) long is ideal. Or let them grow a little larger for spiralising as a lower-calorie alternative to pasta. Beans, beans, good for your heart – and they really are! Beans are naturally high in protein and a great source of soluble fiber, which helps to reduce cholesterol. Darker beans have high levels of disease-fighting antioxidants. 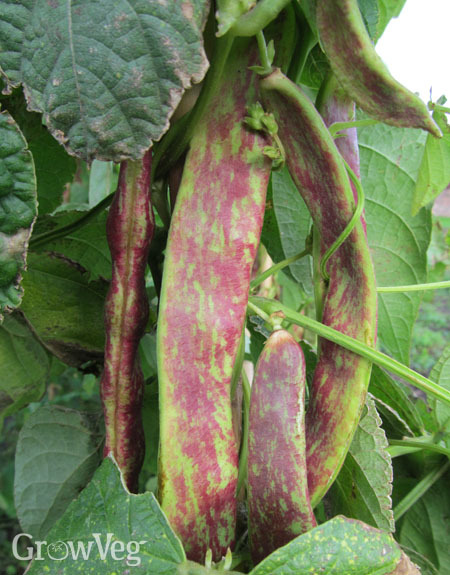 Add in other heart-healthy compounds such as flavonoids and it’s clear beans should be part of every vegetable garden. Crammed full of fiber, antioxidants, vitamins and minerals, kiwis claim a catalog of health benefits, including reducing the risk of heart disease and respiratory problems. Weight for weight kiwis contain more vitamin C than oranges, making them a very easy way to get your recommended daily allowance. Tomatoes are a summer favorite, with many shapes, colors and sizes to choose from. We love them for their aroma, taste – and their nutrient dense fruits – which include vitamins A, C and E, anti-inflammatory flavonoids and potassium. They’re also chock full of lycopene, which may help to prevent some cancers. Smaller, red tomatoes contain the highest concentration of lycopene. Grow your tomatoes somewhere sunny and feed them regularly with an organic liquid tomato fertilizer for the tastiest, healthiest tomatoes. Broccoli is a cruciferous vegetable that along with others such as cauliflower and cabbage is known to contain compounds that help to inhibit cancerous cells. Folate, fiber, calcium, vitamins A and C – all of these work to improve how our bodies function, and how we feel. Very fresh broccoli is best – so it’s worth making some space to grow it. Garlic loves well-drained, fertile soil. You can plant it in fall to give an early summer crop. Number one on our countdown of nutrient-dense crops is kale, which along with other leafy greens such as spinach is a great source of fiber, vitamin C, omega-3 and -6 fatty acids and antioxidants. Kale is a real nutritional powerhouse – great for the immune system, an excellent anti-inflammatory, and with its rich source of nutrients, it’s sure to give your skin, nails and hair the boost that will get you glowing!